This illustrated treasury of proverbs unites the timeless wisdom of Black communities in Africa, the Caribbean, and the Americas, while speaking to the triumphs and challenges of everyday life. Proverbs are presented in vibrant story-poem form; and are uniquely arranged by key life cycle events such as birth, initiation, marriage, and death. The proverbs can be found under themes such as “wealth”, “parenting”, “change” and “strength.” Inspired illustrations introduce each section along with beautiful vignettes showing how African proverbs comfort, inspire and instruct during different phases of life. Lifelines illuminates how traditions, civilization and spirit survive and thrive, despite centuries of loss of freedom, family, identity, language, land, and wealth. The proverbs offer wisdom for every stage of our lives. Collected in one place as never before, it is the perfect addition to the book shelves of families large and small, from Nairobi to New Orleans and every city in between. Every cackling hen was an egg at first. Every time an old man dies it is as if a library has burnt down. as well as every stage of life in between, the proverbs found in Lifelines offer the guidance and wisdom to last a life time. 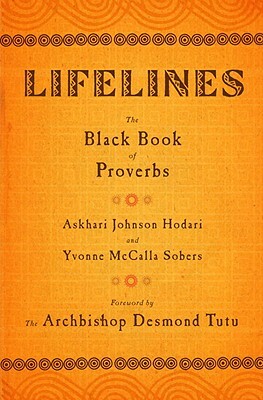 Unlike other collections of proverbs, Lifelines hews closely to the cycle of life and draws inspiration from the authors combined 110 years of experience. Askhari Johnson Hodari and Yvonne McCalla Sobers have set out to let their proverbs both tell a story and stand alone. So whether you flip it open to a random page, read it through from start to finish, or go searching for a proverb to match your unique circumstance, you’ll find just the right lifeline to provide the comfort and guidance you’re looking for. These black proverbs will make you laugh, nod in agreement, remember your grandparents’ wise sayings or simply mutter a heartfelt “amen.” Crammed with pithy advice, Lifelines sheds wisdom on just about every situation from childbirth to adultery to choosing friends. Hallelujah and pass the proverbs.–Betty DeRamus, author of Forbidden Fruit: Love Stories from the Underground Railroad and Freedom by Any Means: True Stories of Courage and Cunning on the Underground Railroad.